What a treat! Often times when you sew for others or send a gift you don't get to see the results on the recipient. What a treat to see the latest christening gown on this precious baby. Isn't he beautiful? Those eyes! He is certainly going be a heartbreaker with those sparkling blue peepers..
And not to slight his equally handsome parents. What a beautiful family on such a special day. A faithful reader asked after the original post about the gown if the fabric from the over skirt was new. Yes, it is. 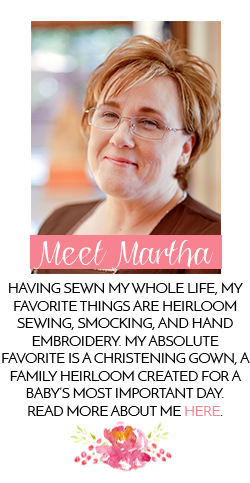 The silk organza was purchased to soften the look of the heavier bridal satin. 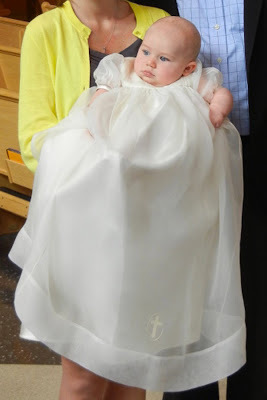 Thanks E for allowing me to share the pictures of your darling baby in his very special christening gown. THe gown is beautiful (as is the baby). I am just amazed that mom was able to hold the baby and not wrinkle the gown. You did a great job. Beautiful gown, baby and family! 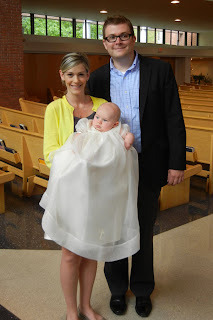 It's so nice to see a christening gown used by another baby in the family, especially such a special gown made from the wedding dress.